Have you ever wondered what percentage of the world's coffee goes down the drain? A lot less now than what used to, according to estimates by the National Coffee Association. This is because there has been a huge uptick in the number of people who own single-serve coffee makers. In fact, about 27% of consumers now own single-serve brewers and it is estimated another 12% will buy one in the near future. Historically speaking, one of the largest consumers of coffee has been the kitchen sink, but now people are making only as much coffee as they need and no more. Given the reduction in sink poured waste, there has been a substantial reduction in global demand for coffee, although paper waste has increased from all those little packets. All is not lost though - there is more profit in those little pods, so even if overall coffee demand is down, profit margins have held up. 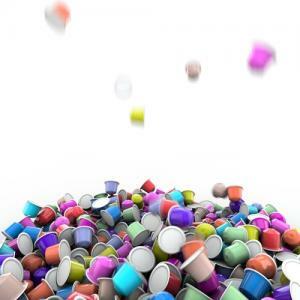 Single cup pods account for 12% of US coffee consumed, but 36% of the revenue. Given the competition for loans these days, many community bankers tell us they see deals flowing past them like coffee swirling down the drain. All is not lost though, as there are clear ways your bank can keep good credits and customers from slipping away to the big banks or other competitors. Low interest rates have been with us for a long time and that has led to an inevitable contraction of margins. Loan customers have also indicated for some time that they would like to lock in their current low rates, but then have almost become complacent since rates never seem to rise. The Fed does seem to be making noise that it intends to raise short term interest rates later this year, but what does that really mean? Banks may consider that if customers don't feel a need to lock in for a long period, this is probably OK because there is more money to be made later when rates rise and the customer has to refinance. There are a couple of problems with this thinking. What happens if the customer can't afford to refinance the credit at a higher rate, or if the customer goes down the road to another institution entirely? On the other hand, what happens if your bank originates a longer term loan at a lower rate than is appropriate for the risk involved? In this case, your bank has taken on both credit and interest rate, which could come back to bite. Lots of banks are addressing these issues by hedging their loans. While no one knows when rates will rise, the data seems to point to higher rates later this year, so bankers should be thinking about this strategy now. Bankers may be concerned about the complexity involved, and indeed doing hedging on your own books, dealing with the paperwork and accounting issues may seem daunting. It doesn't have to be that way - hedging isn't that complicated when done correctly. Community banks need to have a level playing field vs. the largest banks, therefore hedging is another tool in the toolbox to win business and survive in a tough business environment. PCBB has an interest rate swap hedging solution designed specifically to assist community banks with loan hedging. It reduces the paperwork to a manageable level, is not complicated for the borrower or your bank and it helps manage the risks listed above. In the end, the customer has a fixed rate loan and a fixed payment, the bank has a floating rate instrument on its balance sheet and therefore something that will rise as rates rise. As for the coffee producers, they have quickly jumped into the single serving pod business as it has become the prevalent area of growth and profitability. In similar fashion, looking at loans on an individual basis can help you keep your customers from being lured away to a competitor plus give your teams more time to cross sell additional services. Treasury yields fell 3bps as yield levels brought buyers came back to the market. Yields are currently down 2bps ahead of retail sales. The New York Times reports Bank of America and JPMorgan Chase have agreed to update borrower credit reports within 3 months following a bankruptcy. A Bank of America survey of small business owners finds Millennials cite the following impact of social media: 45% feel it delivers informative feedback that has prompted a change in business (vs. 18% of Boomers); 40% have seen an uptick in customers (vs. 20% for Boomers); 14% have seen a decline in customers due to negative reviews and 8% don't use social media (vs. 27% of Boomers). Fed research finds the average loan to asset ratio nationwide was 62% at the end of 2014, up from a low decade mark of about 58% in 2012 and a high decade mark of 67% in 2008. On Deck Capital said it has expanded its small business lending activities into Canada and will now offer loans up to $150,000 for as long as 24 months. Wells Fargo has launched a tool to help small business owners create and update business plans. The tool lets business owners develop written business plans, generate financial statements and better monitor activity. Bankers may find it interesting that the last time the Fed cut rates aggressively (2007 to 2008), rates went down 450bp (4.75% to 0.25%) and the last time they raised rates aggressively (2004 to 2006) rates went up 400bp (1.25% to 5.25%). Since 1990, the average Fed funds rate is about 3.25%, so if we revert to the mean rates could climb 300bp from current levels once the Fed gets moving.